The beret, the predecessor to the tam was a common style of hat in the mid-sixteenth century. The beret had many different construction methods but they were generally felted with using just one color though, the inside of the hat was lined often with another color. The earliest examples of Fair Isle color patterning were found in Scotland, around the 1850. Though they were not made in Scotland but probably came from one of the Baltic Countries. Fair Isle tams are knit in the round with a short area of corrugated ribbing and generally a substantial increase of stitches after the ribbing. The tam is worked with different bands of designs for about four inches then the decreasing for the top of the hat begins. The hat is divided into wedges usually in repeats of twenty-six stitches depending on your stitch count. The decreasing is worked with a double decrease. When looking at the wedge chart, you will notice a tower stitch on the right hand side. This single stitch is the center of your double decrease. Working the tam in this way gives the hat the wonderful design at the top of all tams. The blocking is the most important part of the process to acquire the final shape of the tam. To block your tam, you will need to hand wash it and dry it over a dinner plate, this will give it its distinctive shape. Fair Isle Tam is a great introduction to Fair Isle knitting. We are offering a class Wednesday February 3 from 1:00 pm to 2:30 pm and continuing every Wednesday in February; cost of the class is $45.00, plus materials. 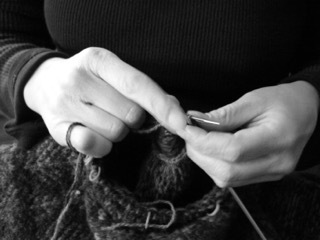 Come join us and learn the art of Fair Isle Tam knitting.